Some Members of Scott Expedition. Recto: A black and white photograph within a black border of a group portrait of 10 on a ship's deck. Lower right corner: London News Agency. 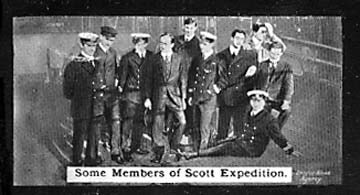 The caption reads: Some Members of Scott Expedition.